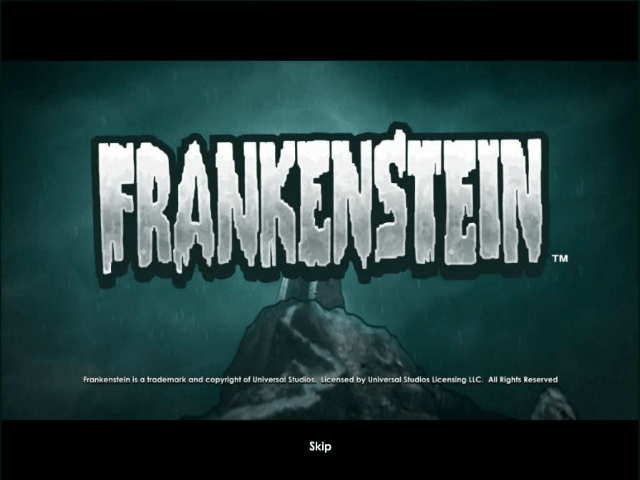 There are a variety of slot games (such as Betsoft's Frankenslot's Monster) which are based on Mary Shelley's cult horror story – and NetEnt's Frankenstein Slot is another very playable adaptation. This awesome-looking game was developed in association with Universal Pictures and it brings a movie-like feeling to the screen from the moment you launch the slot's creepy-as-heck opening credits. The game comes to life with 20 paylines over five reels, with feature-filled Wilds and highly entertaining big payout pursuits. Play Frankenstein for Real Money! 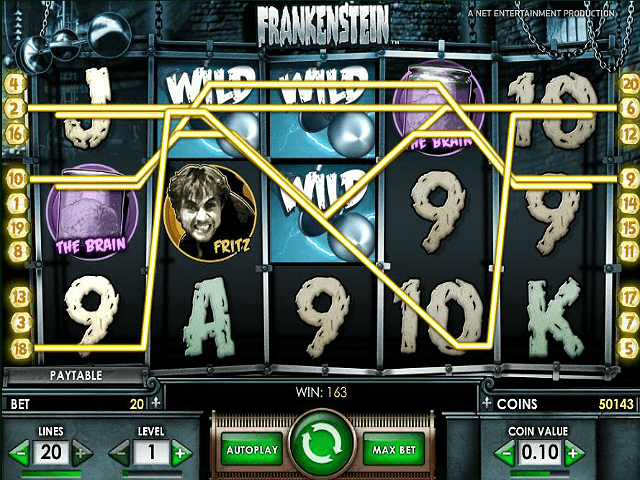 While there are many slot games based on one of literature's most infamous monsters, the Frankenstein slot from Net Entertainment could easily claim to be a creation of epic proportions. Thanks to a deal with Universal Pictures, the game has a real cinematic feeling to it. The gamescape, graphics, and icons are of superb quality. 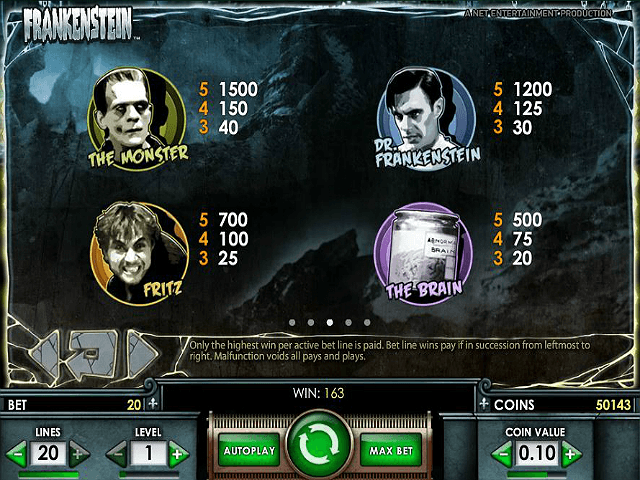 The game's characters have been stylised to have an air of movie character mystery to them, with Doctor Frankenstein, his nephew and assistant Fritz and the Monster itself spinning across the moody reels. They're joined by symbols featuring jarred brains and classic card icons, in addition to Windmill Scatters and Lightning and Fire Wilds, which unlock free spins and bonus features. The return-to-gamer level of 96.7% also gives kudos to NetEnt for fair payouts. The Windmill was infamously the place where Frankenstein was nearly scorched to death in the finale of the original film – and the icon holds bonus power when unleashed, delivering 10 free spins when it appears. You can gain five to ten more free spins when two or three Windmills appear during the bonus round. Lastly, the Windmill bonus also enables you to land 5x multipliers on reel five – show me the money, Dr F.
Frankenstein comes with two powerful Wilds – Lightning and Fire. The Lightning Wild can appear on reels two, three and four and turn two or more adjacent reel positions wild to enhance win potential. The Fire Wild appears exclusively during the Free Spin bonus and acts in the same way as the Lightning – with the bonus that you're guaranteed to get one or more on every spin. 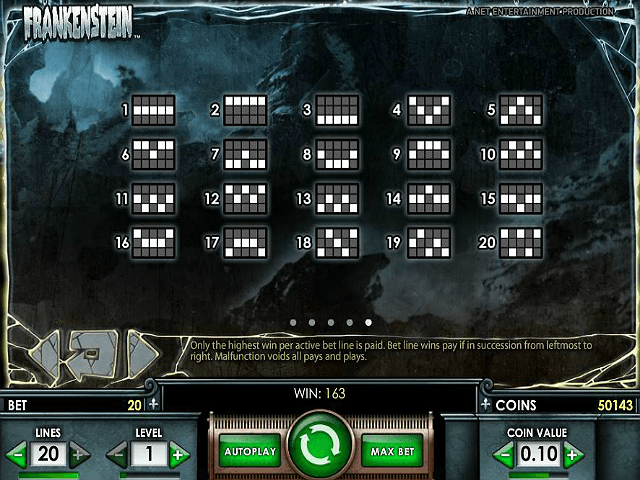 The lab results are in: NetEnt's Frankenstein slot is something of a modern masterpiece and with a higher chance of a jackpot than mega-payout machines, it's definitely worth a few of your shillings. There's no interactive bonus screen game, which is surprising, but it still goes down as one of the most impressive slots around. Share this Frankenstein Review today! 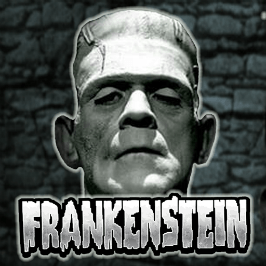 If you like Frankenstein, you'll love these slot titles too!